Big Blake Lake is a 217-acre lake with a maximum depth of 14 feet. It has two public boat launches, and one carry-in access. It is located in the Georgetown Township of Polk County, Wisconsin, approximately 77 miles northeast of the Twin Cities metropolitan area. Fishing is popular and includes panfish, largemouth bass, musky, northern pike, and walleye. The Big Blake Lake watershed is a relatively large watershed (61:1 watershed to lake ratio) and is part of the Upper Apple River Watershed in the St. Croix River Basin. The main inlet for Big Blake Lake is a channel flowing directly from Little Blake Lake on the southeast end of the lake. Additionally, Big Blake Lake receives water from an inlet called Lost Creek located on the north side of the lake that flows from Lost Lake. The outlet is located on the northwest side of Big Blake Lake and flows to the Apple River via Fox Creek. Lakes may be classified according to their primary source of water, and how that water enters and leaves the system. Big Blake Lake is defined as a drainage lake, or a lake with both an inlet and outlet. Drainage lakes receive most of their water from the surrounding watershed in the form of stream drainage, have a prominent inlet and outlet that move water through the system, and commonly have high nutrient levels due to inputs from the adjacent watershed; as such, Big Blake Lake rarely stratifies. Big Blake Lake has three distinct areas with Sensitive Area Designation which have known populations of wild rice. Big Blake Lake has platted access sites with road rights-of-way and one public resort. Big Blake Lake is a significant AIS source water with high public use. 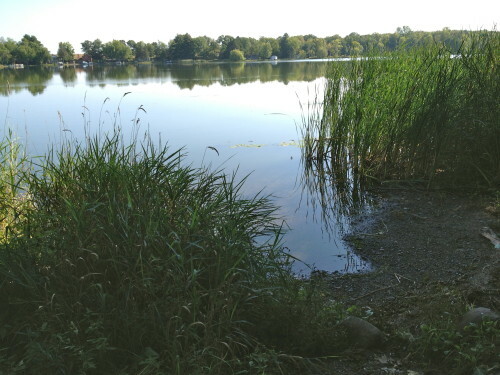 The Big Blake Lake Protection and Rehabilitation District* (District) was formed in 1976 in response to concerns about algae blooms and aquatic plant problems.